I spent last weekend laughing with my girlfriends at Tybee Island. We rented a little condo behind Sting Rays restaurant. While, the restaurant provided a nice fried food smell out by the pool - and maybe a rat? - the condo was in a fabulous location. We were able to walk wherever we wanted to go. We walked to a restaurant on Friday night. We walked to a strict (lots of rules) breakfast at The Breakfast Club on Saturday morning. We walked to the beach on Saturday afternoon. We walked to AJ's on Saturday evening. 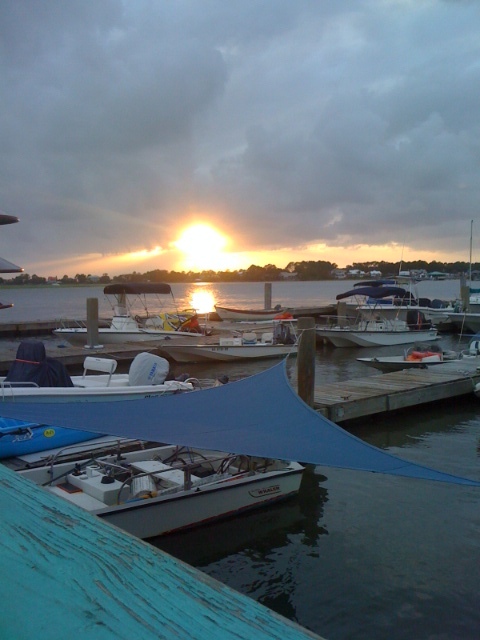 We watched the sunset while we all ate yummy seafood - well all but one. Of course I missed my kiddos and husband - but these weekends are so crucial to stay synced up with those girls you love but just don't see as much as you would like. While I was happily sitting at AJ's on Saturday night I get a text from Judd, "Char just threw up all over mom & dad's bed". Uh oh. She ended up throwing up 3 more times that night. All I wanted to do was comfort my girl, but I also knew her daddy and grandparents were on the case. She ended up staying down at the lake while Judd brought Max back to the ATL. She's staying there until Wednesday. Can you say quiet? It is SO quiet around here - it's very strange. I can't wait to get her back! !